On the European as well as the national level, decisions in terms of energy policy have taken effect over the last decade. In accordance with the current Guideline for Energy Efficiency 2012/27/ EU, the primary energy consumption should be reduced by 20 % in all states of the EU until 2020 [1, 2]. Due to these changes, an energy concept has been set in Germany. Until 2050, green house gas emissions are to be cut down by 80 % compared to 1990 and the primary energy consumption should be halved in regard to 2008 . A third of the end energy consumption is caused by the manufacturing industry, presenting a significant energy-saving potential (see fig. 1). According to the dena (German Energy Agency), companies can usually reduce their energy consumption by 30 % with typical energy efficiency measures . The exploitation of energy-saving potentials makes a considerable reduction in energy costs concurrently possible. The energy costs (see fig. 2) for companies increased by 30 % from 2006 to 2016. Due to the increasingly scarcity of resources and the energy turnaround, a further rise in energy prices is to be expected. Directive 2012/27/EU of the European Parliament and of the Council of 25 October 2012 on energy efficiency, amending Directives 2009/125/EC and 2010/30/EU and repealing Directives 2004/8/EC and 2006/32/EC (Text with EEA relevance), 2013. Federal Ministry for Economic Affairs and Energy, EU Energy Efficiency Directive. [Online] Available: https://www.bmwi.de/Redaktion/DE/Artikel/Energie/eu-energieeffizienzrichtlinie.html. Accessed on: Jul. 31 2018. Federal Ministry for Economic Affairs and Energy, Research for an environmentally sound, reliable and affordable energy supply 6th Energy Research Programme of the Federal Government. Working Group on Energy Balances, Evaluation Tables on the Energy Balance for the Federal Republic of Germany 1990 to 2016. 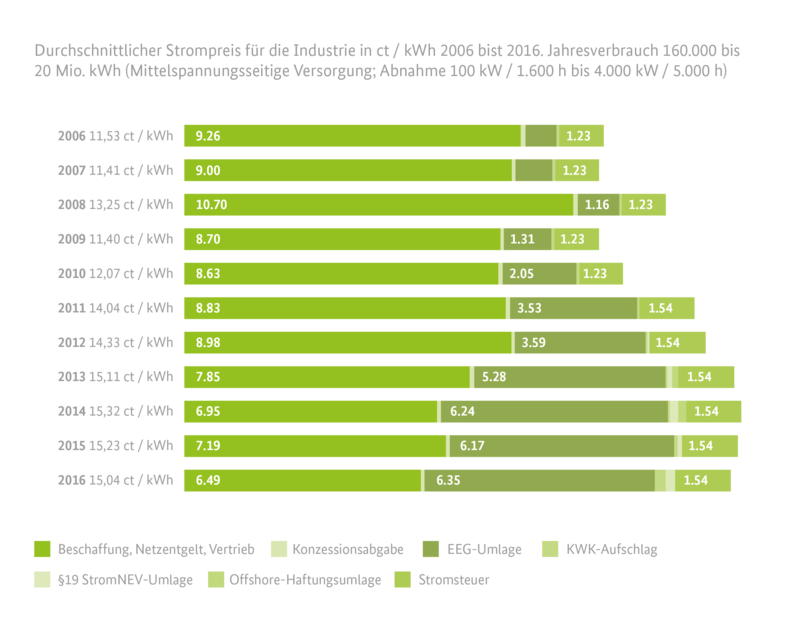 BDEW Bundesverband der Energie- und Wasserwirtschaft e.V., Strompreis für die Industrie (inkl. Stromsteuer). [Online] Available: https://www.bdew.de/service/daten-und-grafiken/strompreis-fuer-die-industrie-inkl-stromsteuer/. Accessed on: Jul. 31 2018. German Energy Agency (dena), Energy efficiency within companies. [Online] Available: https://www.dena.de/themen-projekte/energieeffizienz/unternehmen/. Accessed on: Jul. 31 2018. The industry as a sector with a significant end energy demand provides a great potential to contribute to the climate targets. Rising energy prices are a critical competitive factor for the industry. The potentials for energy savings in the industry are tremendous and many measures often economically advantageous.